Profile 00: Focke-Wulf Fw 190A-5/U8 'White 6', W.Nr. 52596, flown by Uffz. 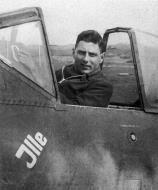 Werner Ohme of 1./SKG10, Poix, 19 June 1943. This profile is intended to portray Uffz. Ohme's aircraft in its original markings, i.e. before the temporary black distemper was cleaned from the fuselage in order that the RAF roundel could be applied. The aircraft was originally camouflaged in a 74/75/76 scheme but had later had matt black applied to the undersurfaces, fuselage sides and rudder. Only the last four digits of the Werk Nummer appeared on the fin. Photo 01: At about 15.00 hrs on 19 June 1943, the pilots of l./SKG10 were briefed by theirStaffelkapitanat their forward base at Poix for an attack on Ramsgate which was to take place that night. The aircraft later took off at intervals, the eighth to leave being Uffz. 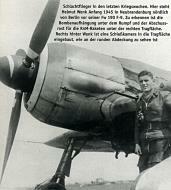 Werner Ohme whose aircraft, 'White 6', lifted off from Poix at 02.00 hrs carrying a 250 kg bomb and two drop tanks. The weather forecast proved to be completely inaccurate with unexpected low cloud and, in addition, Ohme discovered his radio was unserviceable due, he thought to a short circuit caused by excessive dew on the airfield. Nevertheless, he pressed on and crossed the French coast near Calais at about 12,000 feet and headed, he thought, for Dover, but soon lost his bearings. His situation was made more difficult by heavy cloud, and all his attempts to pinpoint his position failed. After a time, Ohme found himself over the sea with coastline to the south; he took this to be France but it was in fact part of the southern coast of the Thames Estuary. Turning inland over what he still thought was France, he came down to about 300 feet to endeavour to pinpoint his position but without avail. He then jettisoned his bomb over open country and arrived over Manston airfield. Coincidentally, the airfield was flashing the same signal as his own base and the floodlighting was on, as was customary at German airfields when an aircraft was overdue. He therefore came down and made a normal landing at Manston. Photo's 01-03: At around midnight on 16 April 1943, eight Fw 190 aircraft from 5./SKG10 and eight from 7./SKG10 took off from Amiens to attack installations along the Thames near the Isle of Dogs. Each aircraft carried one 250 kg bomb under the fuselage and two drop tanks under the wings with sufficient fuel to take them to the English coast. 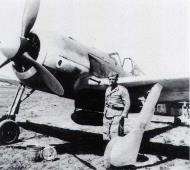 One of the 7.Staffelaircraft taking part in this attack was an Fw 190A-4 flown by Fw. Otto Bechtold who, after climbing steeply to 18,000 feet, crossed the French coast over Cap Gris-Nez and turned on to a direct course for London. Bechtold jettisoned his drop tanks before reaching the coast of Kent but once over land, found that pinpointing his position was difficult owing to ground mist and he became lost. He nevertheless continued on a northward course and after 40 minutes was caught and blinded by searchlights. He evaded the searchlights by releasing his bomb and making a right hand stall turn, after which he regained control, reduced height to 300 feet and headed back towards France. After another 30 minutes he saw about six searchlights all pointing in one direction, and as there was no anti-aircraft fire, thought he was being directed to an airfield in France. He followed the direction of the searchlights, saw the lights of an airfield and, as fuel was running short, put his wheels down and prepared to land. Bechtold, however, was still over England and the airfield lights were those of RAF West Mailing. Staff at this airfield heard and saw a single engined aircraft orbiting with its navigation lights on and, expecting a Defiant, were not surprised when the aircraft fired flares and came into land. The airfield fire tender led the aircraft to be parked by the side of the watch office and one member of its crew jumped out to have a word with the pilot, who replied "in a foreign language". At that moment the fire tender crewman saw the Balkenkreuz on the side of the aircraft and immediately ran to the watch office for a rifle. Meanwhile, an unarmed member of a light AA regiment stationed on the airfield ran out to the aircraft and the "very crestfallen" pilot gave himself up without a struggle. The arrival of this aircraft caused considerable excitement throughout RAF 11 Group and during the 17th April a stream of visitors arrived by rail, road and air, the station recording 67 visiting aircraft as well as many intelligence officers from the Air Ministry. Before being flown away to Farnborough, the Fw 190 was extensively photographed while parked outside RAF West Mailing's control tower. Note the "Do not touch" instructions scratched into the black distemper and the note attached to the fuselage requesting the curious not to enter the cockpit. Photo's 04-05: A close-up view of the drop tank fairing. This contained four steadying studs and two suspension hooks for a steel strap which passed round the middle of the tank. Profile 00: Focke Wulf Fw 190A.4 'Yellow H+', W.Nr. 7155, landed at RAF West Mailing by Fw. Otto Bechtold of 7./SKG10, 17 April 1943 The camouflage of Fw. Bechtold's aircraft consisted of the normal 74/75/76 scheme but with the whole undersurface and part of the fuselage sides smeared with a matt black distemper which partly obscured the aircraft markings, the yellow rudder and the yellow underside of the engine cowling. As may be seen in the accompanying photographs however, the matt black was scratched and worn away in many places. The Green 70 spinner had a yellow tip with a white segment which had been covered with matt black, and although the full markings included a black triangle, this had been completely obscured. The 'H' on the fuselage, which appeared aft of the cross on both sides, was still visible and was edged with black. Only the last three figures of the Werk Nummer appeared on the fin. The guns usually mounted over the engine had been removed and the gun ports and channels on top of the cowling had been blanked off, so that the only weapons retained were the two 20 mm cannon mounted in the wing roots. Note that although shown here with drop tanks still attached, these had been jettisoned by the time this machine landed at RAF West Mailing. Photo 01-02: This aircraft was one of a number from SKG10 which took off from Poix on 19 May 1943 to attack London. The pilot, Uffz. Heinz Ehrhardt of 2.Staffel, climbed to 7,000-10,000 feet and jettisoned his drop tanks before crossing the English coast. Although he received several vectors from his base, he nevertheless became lost, and when his fuel gauge showed it was time to turn for home, he dropped his bomb through a gap in the cloud and saw it land in the sea. He received several more vectors but, as he was then crossing what he believed to be the French coast east of Cap Gris-Nez, he thought them to be incorrect. He was however over the north coast of Kent and had released his bomb into the Thames Estuary. Still believing he was over France, he ignored the vectors, dropped down to 600 feet and fired two flares. A searchlight then obligingly directed its beam towards the nearest airfield and Erhardt prepared to land. As he later explained, he "let down the undercarriage, extended the landing flaps and floated in. The engine stalled, so I opened the throttle again as the aircraft crashed on the wheels and then gave a leap. I drew the control column back, opened the throttle again and let the aircraft touch down. Then it crashed down and shot off to the left. I taxied along the runway, opened the throttle again and turned to the right, thinking that although I had arrived home safely I had smashed up the aircraft! I switched off the engine and opened the canopy, but as I was getting out, someone suddenly shouted "Hands up!" He had arrived at RAF Manston, and his heavy landing had broken off the tailwheel and slightly damaged the rear fuselage and rudder. Examination of the aircraft showed that only 13 gallons of fuel remained in the main tanks. Photo 01: Uffz. Heinz Ehrhardt, seen on the morning of 20 May with Manston's Intelligence Officer P/O Treweeks (centre) and F/Lt. Johnny Wells of 609 Squadron (right). Despite his understandably dejected appearance here, an interrogation report states that Ehrhardt's morale was high. 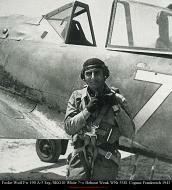 He had joined I./SKG10 in March and, when captured, was on his fifth operational flight. Profile 00: Focke-Wulf Fw 190A-4/U-8 'Red 9' of 2./SKG10, landed at RAF Manston by Uffz. Heinz Erhardt, 20 May 1943 An RAF Crashed Enemy Aircraft Report on this machine describes its finish as "normal grey and blue camouflage" which had been covered with "lamp-black", a very sooty, matt black distemper, but as the accompanying photographs show, this had been applied only to the undersurfaces and fuselage sides. The red number on the fuselage side was unusually small and no attempt had been made to cover it with the matt black which was roughly applied and showed signs of considerable wear. The W.Nr. 5843 was painted on the fin, the rudder was yellow, but roughly covered with black, and the spinner was Green 70 with a one-third white segment. As with other aircraft from I./SKG10, only the two MG 151/20 wing root cannon were carried and an ETC 501 bomb carrier was installed under the fuselage. Wide head armor was installed in order to provide increased protection for the pilot's neck and head, and two recognition lights had been fitted, a green one under the starboard wing in line with the wing cannon and behind the main spar, and another under the centre of the fuselage, just forward of the tail plane leading edge. Unfortunately, this second light had been broken and its color is not known. Remarks:POW 16 April, 1943 when he became lost and landed in error at West Malling airfield in the UK. Remarks:POW believed to be about May 17, 1943 after landing at Manston, UK, after becoming lost. Actual date not reported. Remarks:English POW at wars end in Flensburg. Flew over 300 combat missions. Although born in NY, in his youth, he made his home in Friedrichshafen, in southern Germany. His first mission was over southern England in June, 1943. In July, 1943, the Group transferred to Sicily. Injured in a crash in October, 1943. After recuperationg, he was assigned to NSG 4 in November, 1943, at Kiew, where he flew night and day missions. Wounded a 2nd time in March, 1944. After recuperating, assigned to SG 104 at Tutow-Aalborg. October 1944, assigned to I/SG 151 and later to III/SG 1 (4/45) in defense of the Reich (Berlin). One known victory in SG 1, a Soviet La 5 on 27 April, 1945. Alternate spelling: Wenke (OKL 4/45 victory). Living in Lindau on the Bodensee in 2003. Jager Blatt 4/2003. Friday, April 27, 1945 Helmut Wenke Stab III./SG1 La-5 w.b.